At age twelve, he was given the enormous responsibility of becoming the 19th generation Keeper of the Sacred White Buffalo Calf Pipe, the youngest in history. He has felt, on many occasions, overwhelmed by inheriting such a responsibility for the Lakota, Dakota and North Dakota Nakota Nations at such a young age. He was raised in an era that gave witness to the suppression of his peoples' spiritual practices. He decided to "work for change and let the world know how beautiful our way of life is, so the Seventh Generation can have a better life." His life has revolved around his commitment to work towards religious freedom, cultural survival and revival. In 1986, the Bigfoot Riders, of which Chief Looking horse is a spiritual leader, began fulfillment of a prophecy known as "Mending the Sacred Hoop of the Nation." Chief Looking Horse honors the healing journey by riding with the Bigfoot Riders by horse back every December 15-29th in severe temperatures, which all the committed Bigfoot Riders endure to understand the immensity of the hardship of Chief Bigfoot and his band. They are proud to have touched the spirit of the people that gave so much for our way of life. In 1993, Chief Looking Horse traveled to New York with Elders of different Nations for the United Nations "Cry of the Earth" Conference where he did the opening prayer. The Unrepresented Nations & Peoples Organization invited him to Holland, Netherlands to pray for peace and unity in 1994. The birth of the White Buffalo in Wisconsin, in 1994, directed him to begin another spiritual journey of a four year commitment to organize World Peace and Prayer Day on June 21st in the four directions. The purpose of World Peace and Prayer Day is to bring awareness to the Prophecies with a call to secure the sacredness of the sacred sites that, according to Lakota tradition, dwell every 100 miles around Mother Earth. In 1996, he journeyed from Wahpeton Dakota Reservation, Saskatchewan on the "Unity Ride", where the Bigfoot Riders rode horses to Devils Tower, properly named "Grey Horn Butte (He Hota Paha)", site of the first World Peace and Prayer gathering. The second year of the World Peace & Prayer Day was hosted by Chief Sundown of the Joseph Bighead Reserve in Canada, which was followed by a four year commitment of the 'Unity Ride", that continued in 1998 in Canada, starting m June 21st. The third year World Peace and Prayer Day gathering took place m Pipestone, Minnesota. The holy site is where the sacred blood of the people lies in a vein of stone, which is quarried to make the Sacred Cannunpas, the Sacred Pipes. This particular gathering included a call to the Seventh Generation to run from the different Nations, along with the Bigfoot Unity Riders riding from the east beginning at Birch Coulee, another massacre site. During 1862 Dakota Sioux Uprising, 38 Dakotas were hung in Mankato. New Orleans honored Chief Looking Horse by proclaiming August 27th as "White Buffalo Day" where he was given the key to the city by the mayor in 1996. Chief Looking Horse was awarded the prestigious Canadian Wolf Award in 1996, given to a person who has dedicated their life to working for Peace. The first award was presented to Nelson Mandela, the President of South Africa. Arvol was invited to speak on peace and unity at President Clintons 1996 inauguration. Since the early 90's, Chief Looking Horse has been on the Board of the Society of Peace of Prayer that plants Peace Poles around the world, carrying the inscription "May Peace Prevail on Earth" in four different languages. A Peace Pole was planted at Pipestone, MN during World Peace and Prayer Day 1998. In 1998, he spoke on sacred sites and freedom of religion before the Special Reporter of the United Nations. It was the first time in history that a representative of the UN came to the US to listen and compile concerns for discussion at the UN in Geneva, Switzerland concerning indigenous religious issues. In his work on international peace processes and global healing, Chief Looking Horse traveled to Iraq to pray for peace, acting on the spiritual advice of Elders from his Nation who feared a great war if the Lakota did not pray for peace. He traveled to South Africa to meet with spiritual leader Desmond Tutu on global healing and World Peace and Prayer Day. In 1995, he met with the Dalai Lama to establish a relationship between Tibet and the Lakota Nation. Chief Looking Horse also assists in retrieving the remains of the ancestors from museums such as the Smithsonian. He continues to work towards the retrieval of sacred bundles and human remains in an effort to bring respect and ritual rites back to the sacred. His work has been endless in lecturing on religious freedom, protection of sacred sites and cultural survival. 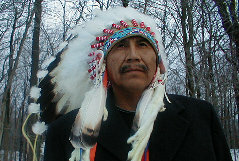 He has lectured in several Educational Institutions, such as: Harvard; Yale, University of Minnesota Minneapolis; University of Minnesota Morris; Stanford University; University of Illinois University of Lincoln Nebraska; University of Washington; Mac Master's University in Hamilton; Ontario; University of Manitoba in Winnipeg; Ashland Environmental College; Santa Fe Indian Art School; Martin Luther King Center; University of Portland Oregon; University of California Los Angeles; University of Montana Missoula; University of North Dakota Grand Forks; Dartmouth University; University of Massachusetts Boston; and many more colleges as well as for organizations, conferences, and symposiums. His living legacy is to bring pride and restoration back to the Lakota, Dakota and Nakota lands, culture and spirituality. In July 2000, he was nominated to receive the "Forgiveness Award" in San Francisco, on behalf of the atrocities that have been inflicted upon the Indigenous People of North America. In September 15, 2001, he traveled to Taiwan by invitation of the Buddhist community there for the Religious Cooperation International Conference, in which he was the only Indigenous Leader in the world to be invited. The following Month he was invited to do a "Wiping of Tears" ceremony in New York at the World Trade Center bombing site. Later that evening he spoke at the St Joseph's Cathedral for the Annual Thanksgiving Program and stressed the importance of Peace in the World, especially being moved by witnessing the horror of the WTC. He has completed the commitment in taking the World Peace and Prayer Day to the Four directions on Turtle Island (Americas) from 1996-1999, then a thank you ceremony in the Sacred Black Hills in 2000. He has re-committed his message of Peace Works by taking the World Peace and Prayer Day ceremony around the World, beginning in 2001 in Ireland, 2002 in South Africa, 2003 in Australia, 2004 in Japan and then back to Turtle Island (Americas) in 2005 for a thank you ceremony. The message is to bring the beliefs in the Creator of all Nations together to pray at once for Global healing energy in healing our Mother Earth such as is performed in healing ceremonies by people who surround an individual who is need of health. The world is in turmoil and this great effort must succeed in order that our generations to come have a healthy environment in surviving.